THE story of the sea is not drawn from musty libraries, but from the song of the wind in the rigging and the crash, of the bow cleaving the wave. The story began before man learned to write, in days when fear and hunger forced him to venture from the land and to contrive some kind of boat. By learning to swim he had managed to cross streams that were too deep for him to ford; but necessity drove him to do better, and from reeds and logs the first raft was evolved. We owe everything to the prehistoric man who, by the use of fire, hollowed out a fallen tree and launched it. He embarked, was spilled out, re-shaped the log, and tried again, until finally it floated when he was in it. Never satisfied, man continued to improve his boats. Ultimately, through hazard, adventure and countless experiments, he achieved the ship. The story of his endeavour, from the Stone Age to the present day, is the saga of the sea. To conquer the water, primitive man was forced to take whatever materials he had, and to use them within the limits of his skill. He used bark coverings. He stretched the skins of animals on light wooden framework. He made the raft buoyant by using inflated bladders. He launched a thousand failures, but gathered experience. PRIMITIVE MAN launched a thousand failures but gained experience in his endeavour to conquer the waters. Early rafts were made of logs and of bark, with coverings of animal skin stretched on a light wooden framework. Rafts were propelled by poles, and were therefore used only in shallow water-ways. Canoes and boats were a great step forward from the raft. Cross-pieces were wedged into the early craft after the hulls had been built; and later on man acquired the knowledge of building the framework first and adding the sides to that. 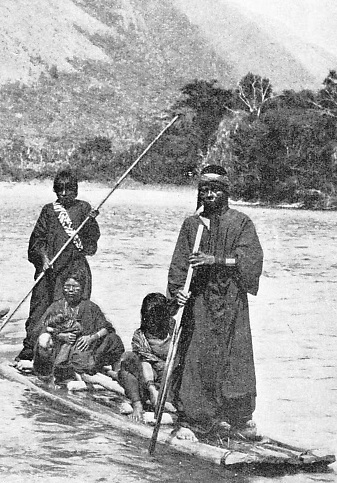 The early rafts were propelled by poles, for man soon learned to put the pole into the water until it touched the bottom, thus propelling the raft by a push. The use of the paddle is now universal. The paddle came before the oar or scull, over which it had many advantages. The paddler could see what was ahead when travelling along a river, the banks of which hid lurking dangers so imminent that he dared not have his back to them. He could not risk the time lost in turning round, which meant the difference between life and death when an arrow sped from an ambush on shore. In a larger craft the oar or sweep is better than the paddle for sea work. Vessels propelled by sweeps, and called galleys, were devised at an early date, and persisted until the beginning of the age of steam. Such vessels were often formidable ships of war. The rowed galley, favourite type of vessel among Mediterranean people of various nations, was a wonderful ship. The winds of the Mediterranean are variable, and, although sail was not neglected, the warships chiefly depended upon the oar. At an early stage two types of ships began to develop, one for war and the other for trading. The trading ships depended mainly upon their sails, and were rowed only in calms; they were broad boats built to carry cargo. The builders of the war-galleys, however, wanted speed; thus these vessels were long and narrow. 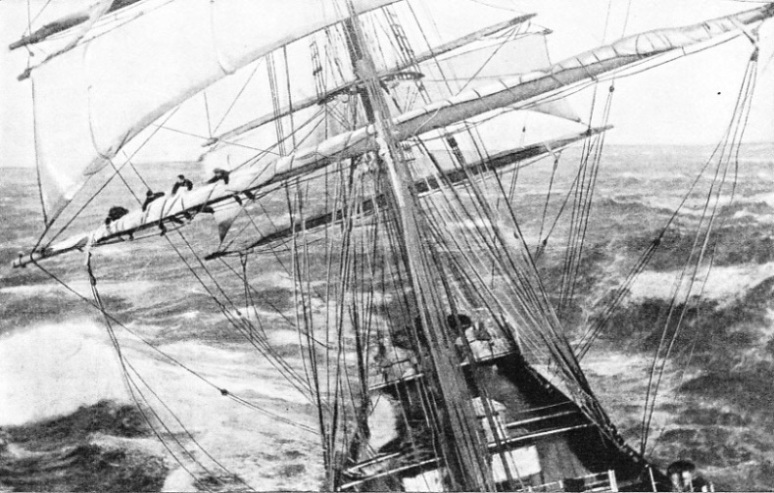 VESSELS PROPELLED BY SWEEPS and known as galleys were devised at an early date. Such vessels were often formidable ships of war, and their use persisted until the beginning of the age of steam. This illustration shows a rowed galley, a favourite type of vessel among Mediterranean peoples. For a thousand years the Phoenician was the great seaman and sea-trader, who kept the secrets of the ocean to himself. The adventurers did not at first explore farther than the Pillars of Hercules (the ancient name for the rocks forming the entrance to the Mediterranean Sea - Calpe, now known as Gibraltar, and Ceuta), beyond which they believed lay the mighty river called the Ocean. Ever in search of new markets, the galleys of the Phoenicians finally crept past the Pillars and ventured northward. The city of Gades, later to be called Cadiz, was founded; up the iron-bound coast the galleys went to Gaul, and across the sea, well out of sight of Gaul, to the Tin Islands (by some identified with the Scilly Islands) and to Cornwall. And onward, even to the Baltic, trading with the barbarians for amber. The skill of the Phoenician was bequeathed to the Carthaginian, and the city of Carthage aspired to world dominion by means of sea power. But a galley of Carthage, wrecked on a Roman beach, and not badly damaged, gave the Romans their first opportunity of building an effective war vessel. They examined the wreck, noting every plank, every rope, and the way in which the stricken ship had been propelled and steered. That galley spelt the doom of Carthage. The Romans built a fleet of similar vessels, and learned to handle them. Carthage, Gades (Cadiz) and Alexandria became Roman. Julius Caesar marched through Gaul, and, seeing the white cliffs of Britain, sailed in 55 BC with 12,000 men in his eighty ships. The eighteen ships with his cavalry were delayed, and, when Caesar, landed near Sandwich or Walmer (Kent), the laggard ships came in sight, but were swept back to France by a storm. Caesar knew nothing of the tides of the Strait of Dover. At the first spring tide the galleys drawn up on the beach were swamped. Caesar returned to Gaul before the gales of the autumn equinox could wreak their fury. Returning to Britain once more, he had again to reckon with the hungry sea, his fleet of 800 vessels giving his legions work for ten days and nights as they fought to pull the ships up the beach out of the sea’s clutches. But the Romans were not yet to settle in the island. 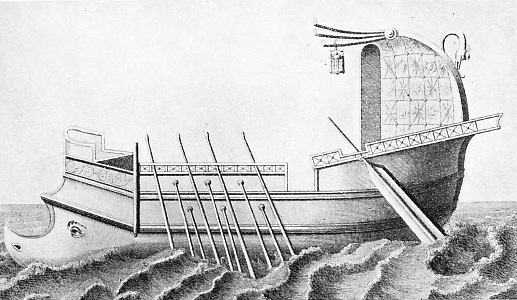 A ROMAN GALLEY of the first magnitude, having three banks of oars. A galley from Carthage, wrecked on a Roman beach, and not badly damaged, gave the Romans their first opportunity of building an effective war vessel. That wrecked galley spelt the doom of Carthage’s dominion of the Mediterranean which then passed to Rome. In fewer than a hundred years after Caesar had feared the autumn gales the ships of the Romans were back in Britain, this time to weather the centuries. Most of the land was conquered; galleys were sent by Agricola from the Firth of Forth round the north of Scotland, and the Romans realized that Britain was an island. Meanwhile it was learnt that Arab ships had found that in the season a steady wind, called the monsoon, could be relied upon to blow a ship all the way to India. There were stories that men from China had come by ship as far as Arabia. Men began to map the world, and among all of these works none is more exciting than the feats of Claudius Ptolemaeus (Ptolemy), who charted not only the earth but also the heavens, and put all he knew into thirteen books. His map of the world suggested that it was possible to sail beyond the Pillars of Hercules and, by turning neither to the right hand nor to the left, to sail to Asia. Nobody then dreamed of America being in the way of such a voyage. Scarcely had the conquest of the Britons been made when tidings of a strange Baltic people reached Rome. When the galleys of Rome arrived at the Baltic the tribes of that coast had inferior vessels; they were made of flimsy wood under the water-line and built up with wickerwork covered with hides above it. Sharp eyes saw the merit of the galleys and swords of the Romans. These Teutonic and Scandinavian tribes began to build long boats which they called keels, made iron weapons, and began ruthless raiding. A significant step forward was made when it became known that the Arabs were using something called a compass. Crude navigating instruments became known to the intrepid seafarers of Western Europe. The invention of the cannon led to great changes in the development of ships, vessels soon became much larger. The Great Harry, a super-battleship built by Henry VIII, was over 1,000 tons. 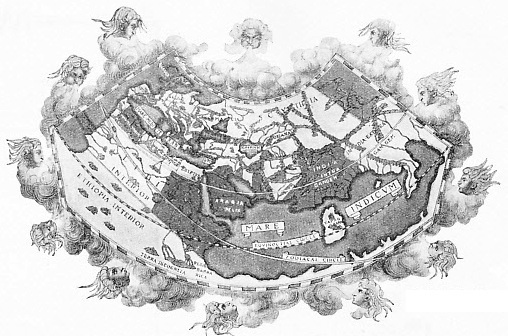 PTOLEMY’S MAP OF THE WORLD, drawn about A.D. 150. Claudius Ptolemaeus (Ptolemy) charted the earth and the sky. His map of the world suggested that it was possible to sail beyond the pillars of Hercules (the ancient name for the rocks forming the entrance to the Mediterranean Sea, now known as Gibraltar and Ceuta) and reach India by turning neither to the right hand nor to the left. Nobody then reamed of America being in the way of such a voyage. In the same way as the compass, the astrolabe - an instrument used by the Arabs and the Greeks to determine the position of the sun, moon and stars - became known in the West, and Henry the Navigator, of Portugal, founded a school of navigation. The western nations were groping towards a truer knowledge of the world when the Genoese, Christopher Columbus, convinced that Ptolemy was correct and that man could sail west from Europe to the east without falling over the edge of the world, went to Spain. There he changed his name to Cristobal Colon, and at last found in Queen Isabella of Spain a patron to back his project. The three ships, Santa Maria, La Pinta, and La Nina, leaving Palos, reached the Canary Islands. Then off into the unknown, in September, 1492. From the quarterdeck Columbus saw a light, and next day what is now identified as Watling Island in the Bahamas was claimed in the name of Spain. When Columbus sailed home with the news, ships sped to the west and found the world larger than Columbus had thought. The discovery was largely due to the Portuguese navigators, and, in recognition, the newer world was divided between Spain and Portugal by the Pope. But the Portuguese also turned their eyes to a sea route to the Orient. Their ambition was to find a shorter route to the El Dorado of their day - the land of gold, of pearls, of spice and of silk. The most famous of the Portuguese adventurers was Vasco da Gama, whose voyages and discoveries are an integral part of the saga of the sea. All were important, but none so valuable as was his voyage round the Cape of Good Hope. To stop the Spanish and the Portuguese from quarrelling, the Pope had given Spain the western hemisphere and Portugal the eastern in 1493. But in England Henry VIII, bent on his divorce from Catherine of Aragon, broke with Rome, and the English did not recognize this allocation of the new world. Fewer than thirty years after Columbus’s discovery the Portuguese navigator, Ferdinand Magellan, lost his life in the service of Spain when he was killed in the Philippines - but his fleet completed the first circumnavigation of the world. Meanwhile, the mightiest of all the oceans, the Pacific, was first seen by a white man in 1513. Balboa, ascending a hill in Panama, called the ocean the South Sea, and a statue to him now stands on the hill. The town on the Pacific side of the Panama Canal is called Balboa after him, and the town on the Atlantic side is called Colon in honour of Columbus. Magellan, who crossed the ocean during his voyage of circumnavigation, sailed in or near the tropics and had fine weather. He called the ocean Pacific, and the name has remained, despite the observations of other mariners in this vast and restless ocean. The early voyagers found no gold in the islands at which they touched; thus many of them were left untroubled until the eighteenth century. The Spaniards were regarded as supermen, and it was not until the English fleet, under Lord Howard of Effingham, smashed the “invincible” Armada that the balance of sea power passed to England. That was in 1588. But before this Englishmen had been sowing the seeds of England’s maritime greatness. THE FIRST ENGLISH SHIP to sail round the world, Sir Francis Drake’s Golden Hind. Of 100 tons burden, she was some 75 feet overall length, 19 feet beam and 9 feet draught. She had a dozen twelve-pounder guns of 4½-in calibre, two bowchasers, and four breech-loading swivels of 2-in calibre. Drake sailed round the world during the years 1577-1581. Sir Francis Drake, who played a vital part in the defeat of the Armada, had sailed round the world in 1577-1581. But in 1583 Sir Humphrey Gilbert sailed to Newfoundland, landed at St. John’s, and founded the first English colony in America. breech-loading swivels firing two-pound shot. The secrets of the early voyagers in the Pacific were kept until well into the eighteenth century, but, with better instruments of navigation and more accurate charts, these secrets were revealed. The astrolabe had given place to the backstafl long before, and this was superseded by the reflecting quadrant of 1730. More important still was the reliable chronometer evolved by John Harrison between 1728 and 1761. Until the perfecting of a reliable machine for measuring time it was not possible for the masters of ships to be sure of the long-itude; although they were reasonably sure of the latitude, they were often hundreds of miles east or west of their reckoning. COMMAND OF THE SEAS went to England after the defeat of the Spanish Armada in 1588. This picture shows the Ark Royal, Lord Howard of Effingham’s flagship against the Armada. 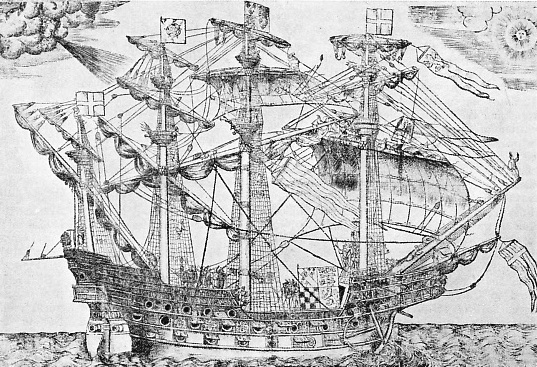 The Ark Royal was built by Sir Walter Ralegh so that he could accompany his cousin, Sir Humphrey Gilbert, to North America; but when the expedition was due to leave, Queen Elizabeth refused to allow her favourite to face unknown dangers. Captain James Cook was the supreme navigator of the eighteenth century in the Pacific. He rediscovered many islands, sailed round New Zealand, and surveyed part of Australia. For long the power of the armed sailing ship was decisive in world affairs. Horatio Nelson sailed across the destiny of Napoleon, and it was the broadsides of the British fleet that frustrated the ambition of the greatest European conqueror since Caesar. But in the nineteenth century, on both sides of the Atlantic, in Scotland and in the United States, the first puffs of steam were seen. Boats with steam engines were built, and these heralded the doom of the great sailing ship. The first steamer to cross the Atlantic was the Savannah, a ship of 300 tons. She arrived at Liverpool from Savannah, in Georgia, USA, in thirty-one days, her voyage having been made partly under sail. That was in 1819. These were among the most significant days in the history of the sea. Men were quick to appreciate the advantages of the new method of transport. In 1838 the Cunard Company began its conquest of the Atlantic, the Government having given the company the mail contract. The Cunard Company, which was to become one of the most famous lines in the world, began modestly with four wooden paddle vessels. The first of these, the Britannia, made the pioneer voyage from Liverpool to Boston, USA, in July 1840, in fourteen days eight hours. Her speed was only slightly more than eight knots. She had wooden paddles, and was 207 feet on the keel, with a beam of 34·2 feet. The tonnage by the measurements then in force was 1150. A few years later the Great Eastern was designed, and her huge hull looms large in the story of the steamship. She was 692 feet long, 83 feet beam, and her tonnage, according to former builders’ measurement rule, was 22,500. She had six masts, a propeller and paddles. But she had no luck. Her troubles began before she put to sea. Brunel, the famous engineer, and John Scott Russell, the naval architect, were responsible for her. The occasion of her launch was one of the biggest fiascos of the period, for she stuck, and did not take the water until three months later. The task of getting her afloat cost £120,000, and the original company, having spent some £600,000 on the ship, had to hand her over to the Great Ship Company for £160,000. She made her first passage to New York, with only thirty-six passengers, in 1860. 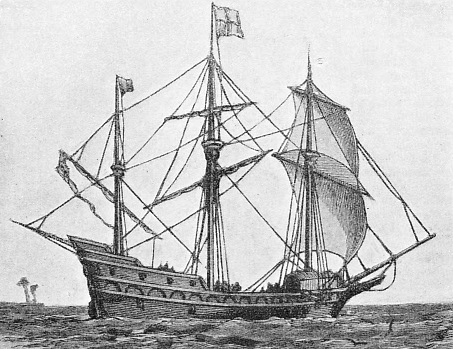 Although she had more passengers on her second trip, she had not been designed for the Atlantic trade. The next stage in her career was as a cable ship. She did good work, but then she went down the social scale. At one time she was bought for a coal hulk at Gibraltar. She was broken up at Rock Ferry on the Mersey in 1888. Although everybody concerned with the Great Eastern lost money, she was a notable experiment. Nowadays sailing ships are a rare sight, but they have left an indelible mark on the history of the sea. They and their crews were pioneers who braved every hazard. They played their part in the sounding and charting of the unknown seas. They helped to make travel the safe thing it is to-day. The passing of sail has not meant the passing of romance; for romance is never far away when the challenge of the ocean calls forth courage and seamanship. The full story of man’s mastery of the Seven Seas can never be recorded, for none can tell of the unknown heroes who ventured, never to return. Their names have perished, but their work endures. The history of the ocean is often fragmentary - chance - preserved flashes, showing against an unbroken background of endurance, achievement and courage. Greater than a racial record, the story of the sea has the whole world as its setting. Unity of purpose and the indomitable spirit of the seamen give to the story an effect of drama, and so the plain tale of man’s maritime achievement becomes the saga of the sea. THE GREAT EASTERN, in her day one of the world’s largest ships. Designed by Isambard Kingdom Brunel, the famous engineer, and John Scott Russell, the Great Eastern was laid down in May, 1853, at Scott Russell’s yard, Millwall, on the Thames. A series of misfortunes befell her and, although she subsequently did good work as a cable ship, she was broken up on the Mersey in 1888. Everyone who was associated with her lost money, yet she was a notable experiment. Her huge hull looms large in the story of the steamship. She was 692 feet long, 83 feet beam, and her tonnage, according to builders’ measurements of that time, 22,500. She had six masts, a propeller and paddles.